Welcome to Family Fun Bike! Family Fun Bike is a family owned business in downtown Salt Lake City. The bikes seat a driver and 6 adults and/or children in a circle you have to see to appreciate! Bring the entire family down for a fun filled ride around town. We run the bikes 6 days a week from mid morning into the evening. See below for more specific days and times. We also can provide special services at most any time or location. We offer many different tours around the downtown area and are available for many different specialty occasions, such as weddings, corporate outings, youth conferences, and anything else fun you can imagine. 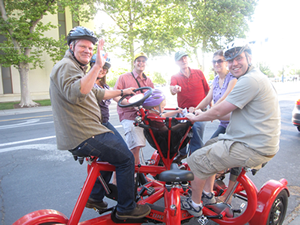 We offer fun bike rides for any occasion. How much are the tours? Can we be picked up at a location downtown? How can we rent a bike? The bike stop is located on South Temple right across the street from City Creek. Or, if you are making an appointment you will be instructed as to where you will be picked up. Please be aware there is a weight limit for the bikes, approximately 250 pounds per saddle, and is the discretion of the driver. We can usually seat 6 adults or a mix of adults and children.